TABPHE Founder Ivory Moore, Sr.
TABPHE Founder Ivory Moore,Sr., one of our beloved founders, passed away on Friday morning, August 1. Together in TABPHE, we mourn the loss of one of our most revered heroes. God bless Ivory and the entire Moore family! 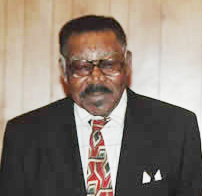 Funeral services for Ivory Moore, Sr. will be held on Saturday, August 9, 2014 at 12:00 p.m. at the First Baptist Church-Commerce located at 1401 Washington St. in Commerce, Texas 75428. The services are entrusted with Cozine & Tarver Funeral Home, 1608 King St., Greenville, Texas 75401. There will not be a wake on Friday. "I join my colleagues in mourning the passing of Mr. Ivory Moore. He was a visionary who saw the big picture, having devoted many years of his life to TABPHE. His passion for improving educational opportunity for African Americans was clear and his presence was unmistakable. His legacy will continue to inspire and encourage generations to come. We extend our heartfelt condolences and prayers to his family and friends."